Wow! 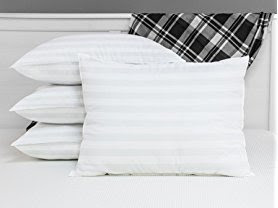 Hurry over because this 4-Pack BioPedic Eco-Classic 240-Thread Count Standard Pillows is only $26.99 (Reg. $40.00)! All natural eco-friendly soft cotton surrounds this perfectly fluffy filled pillow. Just the right amount of premium hypoallergenic fiber creates an ideal balance of firmness, softness and support. Sold in packs of 4 giving you an extreme value. Each standard pillow measures 20" x 26". Machine washable for long lasting freshness and convenience. Made in the USA of imported materials. Each standard pillow measures 20" x 26"